Hello Everyone! This is Kasey. 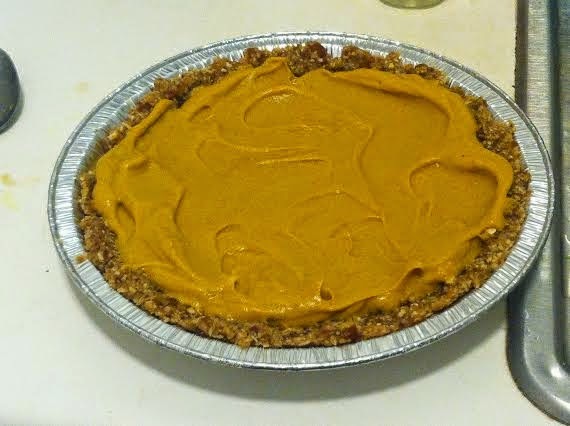 It has been awhile since I have made a post and I am excited to share my pumpkin pie recipe with you. It is almost the holiday season and the perfect time of the year to be shopping for fresh pumpkins in the states! I live in the Chicago area and I go to the farmer's market every Sunday morning. I see the prettiest pie pumpkins and carving pumpkins. Side note: these pictures do not do justice to this beautiful and delicious pie. The pie is easy to make. The only part that is actually baked is the pumpkin. The crust and filling stay raw. It takes a little bit of preparation though because the filling works best when it is refrigerated overnight. If you do not have time just make sure you serve chilled by keeping it in the fridge until you are ready to eat it. 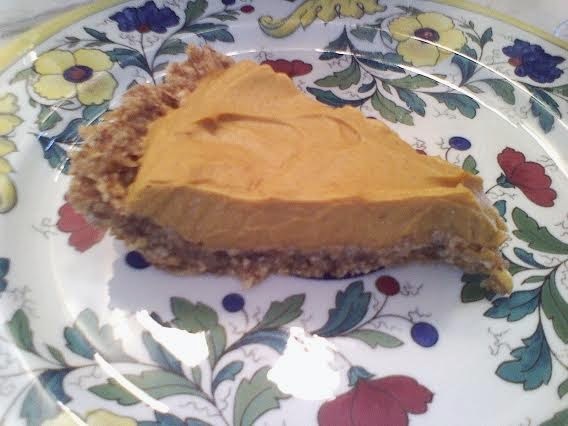 An important start to any yummy pie is to pick out a fresh and preferably organic pie pumpkin. Do not use a carving pumpkin. I picked out a medium sized sugar/pie pumpkin and only used half of it. Look for one the size of a cantaloupe. I like organic because I don't want to eat harsh pesticides. I will make exceptions once in a blue moon, but for the most part I will only buy organic. Once you have found the perfect pumpkin wash it off, removing any dirt from the outside. Cut it in half and then in half again, making four equal parts. Remove the gooey inside & seeds and save the seeds--you can bake them later for a healthy snack that is rich in magnesium and zinc! mmm! Put the pumpkin in the oven on a large pan (lined with baking paper or tin foil if you want to save time cleaning up later). 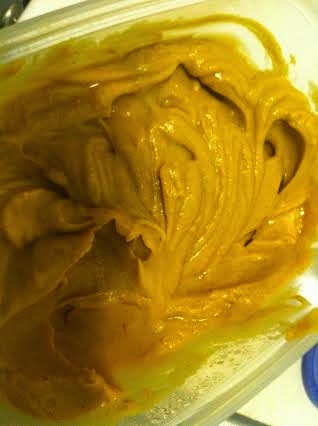 We like using coconut oil to bake with so we used a very thin layer of it to coat the inside of the pumpkin. I have done some research on the health benefits of coconut oil and I like what I am finding out :) My boyfriend and I wanted the flavor of the spices to really seep into the pumpkin so we sprinkled some nutmeg and cinnamon on the quartered pumpkin slices before placing them in the oven. This pumpkin pie crust is its own entity. Side Note**: It is so good I made a second batch to bring to work with me. This stuff is seriously easy to make and a healthy way to get your sugar fix. I always pack a few Larabars to bring with me to eat in a hurry at work. I am very busy in between clients and sometimes I choose not to take a lunch break so I find Larabars to be convenient and healthy. Instead of buying larabars I shaped this crust into bars and ate it instead! It is SO good. This crust is its own raw vegan cookie/larabar/energy bar! I am getting better at measuring ingredients. I am working on being meticulous so I can blog accurately! My inherent nature is to be a free spirit and throw things together, taste them and adjust accordingly. I am turning over a new leaf though because that does not work when you are recording recipes :) The spices are my best estimate because I added a few shakes at the end, back to my old ways, not even realizing it. So adjust the spices if you want a little extra flavoring. 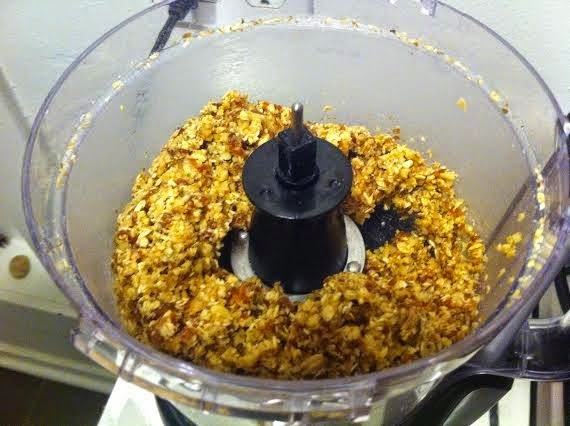 Place the oats into a food processor. Pulse for 30 seconds until the oats are finely chopped up and more of a powder consistency. Then add the rest of the ingredients and add a tiny smidge of water if necessary. When the mixture becomes a goo then you know your crust is ready. Line the inside of a pie pan and set aside in the fridge for now while you make the filling. When your pumpkin is soft and brown on the crust it is time to take it out of the oven. First you want to grab a big spoon and remove the flesh from the skin. It should remove easily. Place it in a bowl or directly into a high speed blender. We only ended up using half of our pumpkin. 1/4 cup of tapioca flour/starch as a binder. You can use corn starch if you like. 1 teaspoon of vanilla extract, cinnamon, nutmeg and a few pinches of sea salt. Blend of full power for one to two minutes until the mixture is creamy. Pour the creamy mixture into your pie pan and allow it to cool off for an hour or so in the fridge (you don't need to bake the pie, just the pumpkin at the beginning). It cuts better after it has cooled off. Cut into pieces and you are ready to serve it :) ENJOY!